January 29 – Commissioner of Insurance Kent Sullivan announced that he will consider staff's recommendation to reduce the workers' compensation classification relativities by 15 percent. Staff recommends that the revised relativities be required for all policies with an effective date on or after July 1, 2019, unless the insurer files an alternative rate basis. The reduction of the relativities by 15% would mark a 44% cumulative decrease since 2011. January 22 – TDI’s Division of Workers’ Compensation (DWC) reported that a Houston company pleaded guilty to workers’ compensation premium fraud in a case that spanned four years. The company was ordered to pay $250,000 to the workers’ compensation carrier. January 18 – DWC announced free webinars covering administrative processes related to providing health care to Texas workers’ compensation injured employees. Webinar topics include an overview of workers’ compensation, health care provider roles and responsibilities, intake and verification of coverage, utilization review, medical bill processing, medical bill denials and dispute resolution, return to work, maximum medical improvement and impairment rating billing, and certified workers’ compensation health care networks. January 11 – DWC announced that Commissioner of Workers’ Compensation Cassie Brown had approved the Medical Quality Review CY 2019 Annual Audit Plan. Determining Sanctions; Other Remedies. The rule amendments implement SB 1895 which requires the DWC to communicate to the subject of an enforcement action the relevant statute or rule violated, the conduct that gave rise to the violation, and the factors considered in determining the penalty. January 7 – DWC announced the adoption of amendments to Rule 148.17, Special Provisions for Sanctions. The amendments align the rule with changes made by HB 1456 which deleted the requirement that, when an administrative penalty is assessed, a person must pay the penalty or post a bond while seeking judicial review of the administrative decision. January 31 – MarketWatch reported that Carisk Partners (Carisk), a specialty risk transfer, care coordination company, has selected MDFlow Systems to create a case management system exclusively for the workers’ compensation industry. Janaury 30 – WorkCompCentral reported that Medicare has slashed hospital outpatient payment rates. The American Hospital Association has sued HHS over the change, which it calls an ill-advised and unlawful payment reduction to the outpatient prospective payment system. January 30 – Business Insurance reported that experts have said the frigid cold blast affecting the Midwest and the snow projected for the South can increase safety hazards and result in an uptick in workplace injuries. Slips, trips and falls increase in the winter because of the changing precipitation from rain to ice to snow and back, and the effects these weather hazards have on walking surfaces. January 26 – The Society for Human Resource Management (SHRM) reported that the gig economy doesn’t fit yesterday’s work model, as businesses and laws play catch up. 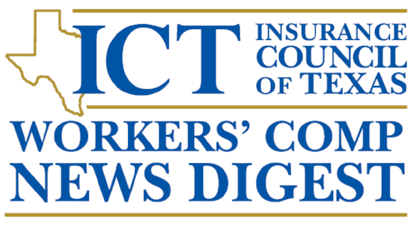 January 17 – WorkCompCentral reported that a changing workforce and maintaining profits are among top concerns expressed by insurance executives interviewed by the National Council on Compensation Insurance in its annual Focus on 5 survey. January 9 – WorkCompCentral reported that some workers’ compensation payers are starting to address the social determinants that could impact an injured worker’s recovery.